It’s the last day of the year, and with the Qatar Masters now over it’s time to begin looking back on 2015 – and forward to 2016! Magnus Carlsen rescued what was looking a mediocre year by his standards with victory in London and Doha, and in a blog post talks about how the London Chess Classic restored his confidence. 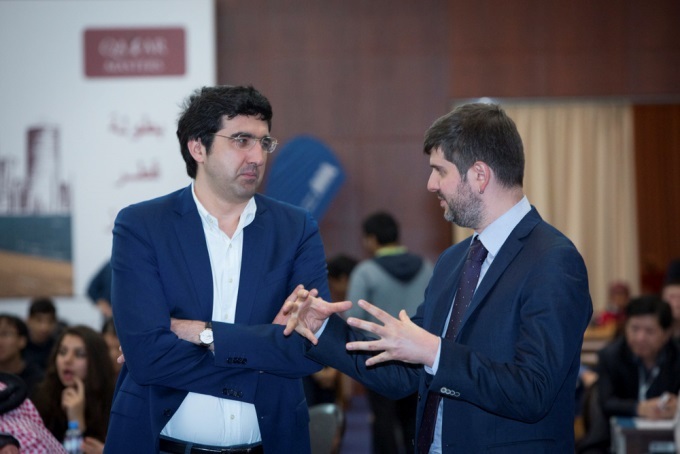 The closest the chess world has to a players’ representative is Emil Sutovsky, and the President of the Association of Chess Professionals both listed his Chess Oscar picks in English and posted a “Quick Review of the Chess Year” in Russian. We’ve included both below. 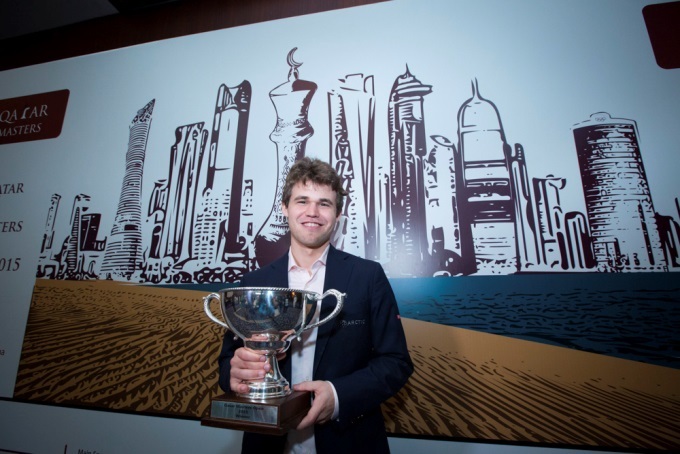 So Magnus Carlsen followed victory in the London Chess Classic and the Grand Chess Tour by winning the Qatar Masters Open, the last major event of 2015. Here’s what he wrote about that in his blog for sponsor Arctic Securities. Qatar – ending 2015 on a high note! Qatar Masters Open 2015 has been a great experience. The strong field, the playing hall, the Torch Doha hotel, the atmosphere, summer outside and the organizer’s attention to detail made this an extraordinary event. And for me personally winning really helps. Success brings confidence of course. By nature I’ve always been optimistic prior to tournaments and before individual games. As a youth I played a majority of higher rated players but never felt intimidated. Nonetheless my not so stellar performance in the six months period prior to London Classics did put a dent in my usual confidence, and I needed to stabilize to get back on track. I was close to winning several of the first games in London, but maybe the combination of somewhat lowered confidence and slightly more of a safety first-approach than earlier this year contributed to some missed opportunities. In Qatar I managed to continue where I left in London (where I won two out of the last three games as well as the tie-break rapid match against M.Vachier-Lagrave). After conceding a draw in the first round I won four in a row including a quite spectacular game against Chao Li (2750). There were more draws at the top boards than last year, and after two draws against Wesley So and Anish Giri I was still joint leader and on board one in the penultimate round. Despite the black pieces I won quickly against Mamedyarov. His attacking plan simply didn’t work, but understandably he didn’t want to play d5 and enter a slightly worse ending with a miserable few hours ahead. A few accurate defensive moves were sufficient to defuse his attack and a pawn down he went berserk and lost immediately. As white against Kramnik today I decided to play safe. Being half a point behind me, Kramnik needed to win but seemed happy with a quick draw in a topical Ruy Lopez 5.Re1 line. Last year’s winner 21 year old Yu Yangyi finished impressively again with two wins including a fighting victory against Wesley So today. In the Blitz tie-break for first, Yu never got going. I won a decent game with white and when he had blundered a piece on move 16 in the second game he simply resigned. 7/9 followed by 2-0 in the tie-breaks, and my first Open tournament in some 8 years ended with victory! I’d like to thank Arctic Securities and my other main sponsors for the good and pleasant cooperation in 2015 and wish all of you a successful 2016! Carlsen is still the best. Despite no longer looking invincible, the World Champion is almost always at the top of his game in the decisive moments, allowing him to win the majority of tournaments. His opponent in the World Champion match (November 2016) will need to do a lot of catching up in order to have realistic hopes of victory. However, that no longer looks impossible. The chasing pack – in 2015, second place was held by Kramnik and Giri, Anand and Nakamura, Topalov and Caruana… There’s no clear no. 2 in the world hierarchy, although the most consistent results have been posted by the youngest of the pretenders – 21-year-old Anish Giri. However, stability is one thing, but in order to win a World Championship match you need to win the Candidates Tournament (March 2016). Curiously, Giri still hasn’t won a single top tournament. It’ll be funny if his first such victory is the Candidates Tournament. Young stars have, as always, burst onto the chess scene. 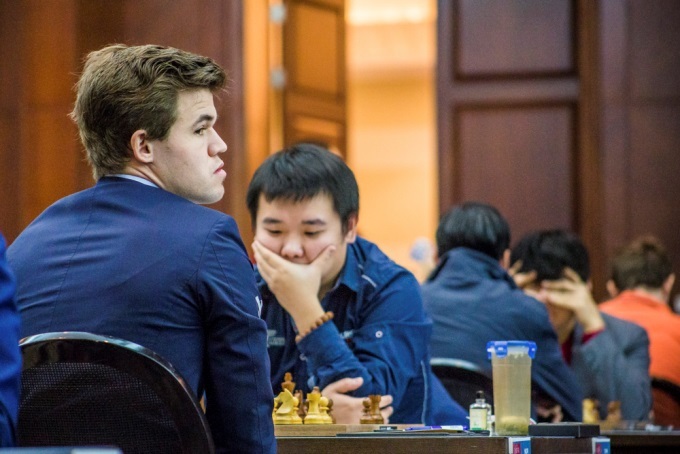 16-year-old Wei Yi played so impressively this year that many are already marking him out as one of Carlsen’s successors. In my view that’s a little premature, although of course the young Chinese player is exceptionally talented. The first real serious test of his ability will be the tournament in Wijk aan Zee in January 2016, where he’ll compete with Carlsen and many other elite players. So far the Chinese players haven’t managed to overcome that invisible barrier and none of them has yet achieved a permanent place in the world’s top 10. Nevertheless, the progress of the Chinese players is a topic in itself. In 2015 the Chinese team brilliantly won the World Team Championship, confirming that their victory in the 2014 Olympiad was no fluke. There are seven Chinese players in the world’s top 40 according to rating. I’d venture to suggest that Wei Yi and the slightly older Ding Liren won’t be satisfied with that cosy position in the peloton and will continue their climb next year. In women’s chess there was also no lack of memorable events. The player of the year is undoubtedly Ukraine’s Mariya Muzychuk, who won the World Championship title in a fiercely competitive knockout marathon. Many predict she’ll soon lose her title in a match against the long-term leader of the women’s rating list, Hou Yifan (March 2016), but in my view things aren’t so straightforward. Mariya not only won the World Championship but also backed that victory up with convincing results afterwards. You also can’t ignore the exceptional play of the former World Champion Alexandra Kosteniuk over almost the whole course of the year. It’s also very pleasant for me that the chess year will start with a tournament dedicated to the centenary of the birth of Paul Keres. The ACP is running that in conjunction with the Estonian Chess Federation. Join us and love Chess! Of course you don’t need to wait that long to watch some chess action. Jon Ludvig Hammer has 4/4 in the Rilton Cup and has just crossed the 2700 barrier on the live rating list for the first time in his career. Today Tomorrow he takes on Israel’s Maxim Rodshtein, whose 4/4 includes a win over Poland’s Bartosz Socko. Watch all the action LIVE from 15:00 CET. Oh, and before we forget, Happy New Year from everyone here at chess24!